Love, romance and friendship is what you are looking for and can easily to find at IndianFriendFinder.com, online free-to-use website for Indian singles. Indianfriendfinder.com is a bright site with wide options for meeting a friend or a life partner. Diversity of site sections (home, JOIN NOW, member login, browse, chat, magazine, video, blogs, groups, help) assist you from the very first moment you open this site. Clearly structured info found in the profiles of members helps you understand what you can expect from IndianFriendFinder.com. Thousands of Indians have joined it and are happy now enjoying their relationships. Anonymous e-mail, instant message and chat help you to be open with interesting site users. The total number of members reaches about 400 thousand singles today. New members constantly join this site thus making its number grow. Founded in 1996, the site has been successfully uniting Indian singles together for almost 2 decades now and has gained received the highest marks for its service provided. Benefit from online exclusive chat rooms, news and blog right now! This fascinating virtual life is realized with IndianFriendFinder. 1. Exclusive chat rooms. Users just pick up what they need, simplifying their search to minimum. Amazing atmosphere of Lobby, Hulchul, Nukkad, Cricket Corner, Jai Bollywood, India Fate, Shaddi ya Barbaadi, Thirties’, Pool Side or Screening Rooms is filled with romance and ease. 2. My magazine. This section is specially oriented for ideas’ sharing between site users. Indianfriendfinder.com members are free to publish and read exciting articles like “Why are you here?” or “Anyway”. 3. Video. Members can enjoy watching videos at the site and share their emotions with other members. 4. Blogs. It’s a perfect opportunity to get to know others better and open yourself to other members. After creating a blog, you regularly update info there raising your popularity by sharing your real life experience. For example, it’s about clothes, make-up, women and men. 5. Registration form. Account set-up will take you only a couple of minutes. The site has several items for its members to fill in: gender, orientation, intention, birthday, country, state, city, e-mail, and a username. This is the standard form for its members. Due to it, you immediately see the members’ purpose of joining this site. 6. General information. This section gives answers about site purpose, conditions of using it, legacy of its members. Moreover, members can find it useful as guidelines for searching other members, e-mail them, or access problems. The world of love, romance and friendship is free for you here. Join the site to enjoy all beauty of online meetings and personal growth opportunities. 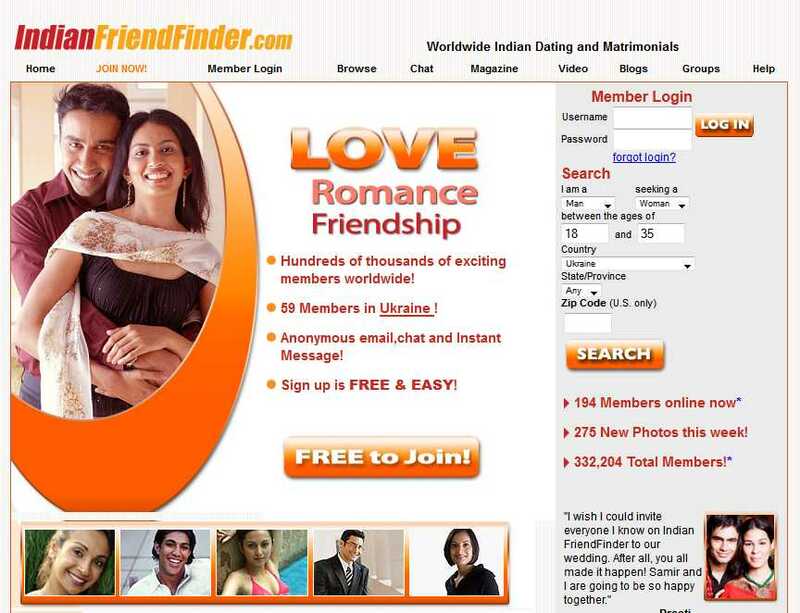 Our indianfriendfinder.com review shows it is a great resource to find romance, love and fun. Its members are given a variety of options to get the best out of online meeting and dating services. Thousands of users prove it by their examples. Happy life stories show and stimulate new members to be active, open and honest. All people who haven’t found their partners in life yet, will definitely succeed with indianfriendfinder.com. This review is a good guideline on how to build relationships and improve your social life. Personal growth is a never-ending process and indianfriendfinder.com is efficient in it.